Before launching into a discussion of Service Operations, let's first step back and think about what the term means to level-set our discussion. Your Service Operations are basically what you are doing on a day-to-day basis to take care of business, which include providing effective and efficient delivery and support of services to ensure the business meets its goals and objectives. With regard to IT, Service Operations is doing what you can each day to ensure value for your internal business customers, your organization's external customers, and your service providers. Service Operations is where you demonstrate to your customer the quality and value of IT to the business. It is where you deliver on your IT service level promises. Do your business customers view your IT Service Operations as valuable and necessary to business success? If not, you need to determine why, and work to improve your Service Operations. ITIL V3 can be immensely helpful. ITIL V3 is useful for IT leaders for effectively managing Service Operations in that it provides detailed proactive and reactive process guidelines, methodologies, and tools. These ITIL V3 concepts will provide IT leaders with the knowledge they need to make better decisions for managing service availability, controlling services demands, optimizing capacity, fixing problems, and efficiently and effectively scheduling operations. ITIL V3 provides guidance for five Service Operations processes as they are used within five functions (see Figure 3.1). Figure 3.1: Service Operations processes and functions. The focus of Event management is to effectively and efficiently manage IT service events throughout the entire event life cycle. Events are basically any detectable occurrences that could result in a deviation to the service. There are normal events and exception events. Normal events include such events as scheduled operation starts and completes, when a user logs into an application, and so on. Exception events, which are triggers that need some type of response, include application failures, licensing violations, server performance below SLAs, physical events such as smoke and fire that shut down processing, and so on. The focus of incident management is to effectively manage the complete life cycle of all incident types and return the service to normal business processing. An incident is basically any unplanned interruption to an IT service (such as complete loss of power) or reduction in the quality of the service (for example, a longer-than-acceptable response time from a business application). The focus of problem management is to effectively manage of the entire lifecycle for an incident, including the determination of cause and elimination of the root problem. The main goal of problem management is to prevent incidents from occurring in addition to minimizing the negative business impact of incidents that could not have been prevented. The focus of access management is to give your business customers the necessary access to information resources so that they can appropriately use IT services, data, or other information to fulfill their job responsibilities and most effectively support business. Access management is closely aligned with, and significantly overlaps, information security in that its goals include protecting the confidentiality, integrity, and availability of information assets by ensuring only those individuals who are appropriately authorized may access, modify, delete, or otherwise handle information assets. You will often hear access management referenced when speaking about rights management and identity management; terms used often by information security practitioners when discussing the individuals and entities authorized to access specific network resources. The focus of Request Fulfillment is the management of the entire life cycle of service requests. Typically, the Service Desk makes requests to the area of IT responsible for the service involved with the request. Common requests include giving access to a user or a group, installing software, and moving a computer. Unlike incidents and problems, requests are planned and implemented when most appropriate to the business, based upon business impact analysis (BIA). Successful IT leaders and personnel need to consider IT's contribution to the business whenever they make a decision, and with every project they decide to undertake. After all, if the decision or project is not going to support or improve business, what is the reason for doing it? The heart of ITIL V3 practices is to support this business-centric approach to managing the IT infrastructure and Service Operations. A goal of IT leaders should be to demonstrate business value, and ITIL V3 can assist with meeting this goal. Not long ago, IT leaders approached IT management and Service Operations from a purely technological point of view. IT management reports typically consisted of statistics documenting the average number of million instructions per second (MIPS) that were processed during each hour of the work day as well as the number of "abends" (abnormal ends) for the previous night's batch application processing runs. If business unit leaders read these reports, their eyes would either glaze over or they would complain, "Why can't these IT folks use normal language!" ITIL V3 provides IT leaders with the help they need to effectively communicate IT issues to business customers by taking a business approach instead of a technology-centric perspective. By doing so, IT leaders can establish suitable and understandable objectives for IT Service Operations for business customers to understand and better appreciate. 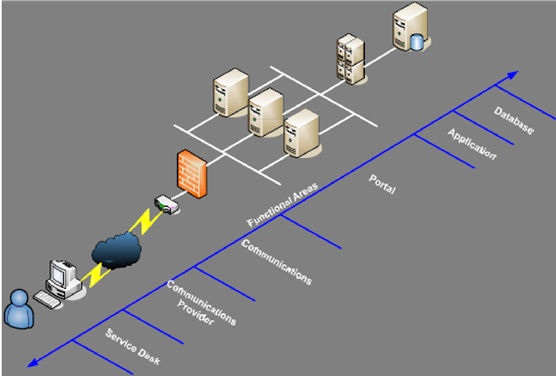 For example, by dynamically mapping IT assets to the appropriately named business services, IT leaders can shift their view from a topological technology map to one that shows the IT-servicesto-business-assets linkages. This mapping allows IT leaders to link IT events to business outcomes and provide reports and other information in business-centric language. By managing Service Operations from a business perspective, IT leaders will better optimize the performance and availability of business services and processes as well as better support business applications and the foundational infrastructure. Let's do another level-set to make sure we are all talking about the same thing when we talk about a "service." The Office of Government Commerce defines "service" within the ITIL V3 documents as "Delivering something of value to a Customer that is not goods (physical things with material value). Examples of services include banking, legal support or email. Service is also used as a synonym for IT service." Within a typical business, there are many services. To most business customers, the business value of services such as mail, phone, payment processing, and marketing is fairly apparent. But the business value of IT services is often quite nebulous to those outside of the IT area, creating a chasm of communication between the IT and business areas. IT business leaders can bridge this communications chasm by helping business to understand the IT services that are available to, and used by, the business, and then to demonstrate, through exceptional Service Operations delivery, the value IT brings to business. Chapter 1 discusses the definition of IT services in depth. However, to help best define the business value of Service Operations, let's quickly review the definition of IT service and explore how it changed slightly from ITIL V2 to ITIL V3. Consider the different perspectives of an IT service. IT leaders typically consider a service as being an interconnected group of applications, systems, and network components (see Figure 3.2). Figure 3.2: The IT view of a "service" (Source: HP). However, typical business users view an IT service as something they use on their computers to help them accomplish their work responsibilities (see Figure 3.3). Figure 3.3: The business customer view of a "service." The customer view is much more limited than the IT view. This idea is one that IT leaders should always remember. Under ITIL V2, an IT service was viewed as a set of related functions and processes provided by the systems and network components that support one or more business areas. The service was composed of hardware, software, and communications components but was viewed by the business customers as a distinct, self-contained unit. The services were managed as processes that were aligned to the related activities and output, but they were not strategic. Each of the IT services was basically just a group of processes, people, and tools that were supported with no knowledge necessary, or considered, for what the business customer wanted to achieve by using the service. ITIL V3 puts business into IT services! It emphasizes the importance of an IT service to deliver to business customers by helping them to reach their targeted business outcomes without needing to own the specific IT costs and risks. ITIL V3 preaches that IT leaders must build services to meet expected business outcomes. Consider a very simple example of incident response. Very generally, ITIL v2 is all about IT process and the goal is improving IT efficiency and effectiveness, so this service would have been viewed as a matter of how quickly the incident response took to resolve the problem, how many IT and IT personnel resources were used, in what ways can the service can be improved, and so on. ITIL v3 looks at incident response from the viewpoint of the business: did the incident response time negatively impact business? In what ways? What needs to be changed about incident response to prevent this negative business impact? IT Service Operations considers how well the full range of services, processes, applications, and other activities and supporting tools are performing. If performance is great, business benefits; if performance is poor, business suffers. Key performance indicators (KPI) can be used quite effectively to determine the efficacy and efficiency of IT Service Operations. The Office of Government Commerce defines "Key Performance Indicator" within the ITIL V3 documents as "A Metric that is used to help manage a Process, IT Service or Activity. Many Metrics may be measured, but only the most important of these are defined as KPIs and used to actively manage and report on the Process, IT Service or Activity. KPIs should be selected to ensure that Efficiency, Effectiveness and Cost Effectiveness are all managed." The value of the KPIs is increased with a focus not only on projects but also, perhaps more importantly, on ongoing day-to-day IT Service Operations that involve the hardware, software, applications, data, and networks needed to run the business. This makes sense because IT literally powers and enables the business. Consider the KPIs the IT areas used to, and still widely, depend upon to determine how well they are doing. They looked much like the data in Table 3.1, with many numbers related to technical components. Notice anything missing in these metrics? The relationship of these numbers to the business. Table 3.1 can be improved upon to provide value to business areas if modified (see Table 3.2). How many incidents occurred that caused business processing to be shut down? For how much time each? What percentage of problems have we eliminated? How many unplanned IT changes occurred that took away application availability? How long did each change take to accomplish (application unavailability time)? These types of business KPIs can provide clear evidence of how beneficial IT is to the business and/or in what ways it is impeding business. Business leaders are used to reviewing a wide range of regularly created reports. Taking a cue from the ITIL V3 philosophy, IT leaders should also regularly review reports written from a business point of view to help them determine the health of their Service Operations. For example, IT leaders can look at reports that show how many sales were likely lost during a period when the e-commerce site was down by comparing numbers with the correlating average sales for the same time period when the e-commerce site is normally available. By keeping a close eye on the performance of IT services, IT leaders can spot problems and incidents that may not otherwise be identified by IT personnel or other types of tools. Reviewing performance and KPI reports can optimize performance and availability of business services and processes as well as support applications and the foundational infrastructure. According to a 2008 Aternity survey of Global 1000 enterprises, more than 35% of survey participants said their top priority during 2008 is preventing IT problems before they affect end users and business productivity. Finding problems before users report them is extremely valuable to the business. Predictive operations and automation allows for this early problem identification. Automation enables the IT service areas to quickly correlate events, effectively isolate problems, and improve the average time to repair. Meeting business customer expectations is the biggest pressure for IT leaders. As Figure 3.4 reveals, customer expectations eclipse all other concerns currently facing IT leaders. This concern is prompting the transformation of the IT organization from one historically focused on technical knowledge to one focused on providing technology to the rest of the business, thereby bringing IT closer to the end user. Automation plays a major role in addressing the need to meet customer expectations; it can no longer be left to chance, manual processes, or ad hoc activities. Figure 3.4: What's important for IT leaders. Incident management, event management, and problem management can seem deceptively straightforward from the process view, at least from the business perspective. When a critical application goes offline, business customers often think it should be brought right back up with the flip of the switch. After all, it is all on a computer; how hard can it be, right? However, as IT leaders know, these activities are actually usually quite complex, often spanning multiple systems, involving many people in many different areas, and covering multiple processes. If not approached in a consistent and repeatable manner, incident management, event management, and problem management can result in inconsistent actions and troubleshooting and will likely take an unacceptably long period of time to repair and process. Let's look at a couple of examples. IT leaders are under fire frequently from the business areas because of the length of time IT takes to respond to and resolve incidents. Incident management can be improved dramatically and noticeably through automating common, repeated processes, such as incident alert diagnosis and resolution by performing activities such as writing scripts or using third-party software tools. Using automated problem management tools helps to ensure best practices are consistent and the time to resolution is greatly improved over manual processes. You can build such processes and tools in-house if you have the resources and talent, or you can purchase one of the many products available. Organizations can manage business services' infrastructure and the health of applications and services from a business customer perspective using Business Service Management (BSM); an approach or solution that includes processes that can be enhanced through a variety of tools. BSM is now a formally defined process within ITIL V3. To examine BSM, we must first consider Business Service. Visibility to the business customer is key to what is considered a Business Service. As a little exercise, let's consider a few IT services and determine whether they are considered Business Services. The Office of Government Commerce defines a "Business Service" within the ITIL V3 documents as "An IT Service that directly supports a Business Process, as opposed to an Infrastructure Service, which is used internally by the IT Service Provider and is not usually visible to the Business. The term Business Service is also used to mean a Service that is delivered to Business Customers by Business Units. For example, delivery of financial services to Customers of a bank, or goods to the Customers of a retail store. Successful delivery of Business Services often depends on one or more IT Services." Time management is the service all personnel use to submit their weekly attendance, vacation time used, number of hours worked that were devoted to specific projects, and so on. Each week, each employee logs into the time management system, fills out the proper fields using the appropriate time codes, and submits the time card for review by the appropriate manager. Each manager then reviews each time card and gives approval or sends it back to the employee to be corrected. When approved, the timecard is automatically sent to multiple business units, including Human Resources. The back-office applications take the data from the time management system, and the applicable data from the timecards are automatically fed into the employee payment processing system so that, on each pay day, the employee checks are automatically generated and printed. Is the time management system an IT Business Service? Yes. Each employee interacts directly with the time management system, interacting with the associated applications so that the necessary data is entered into the system. Is the employee payment processing system an IT Business Service? The answer is debatable. However, if you are looking strictly at whether the business customer is directly supporting a business process, which payroll processing certainly would be, then the answer is yes. New employee orientation is the service used when hiring a new employee and performing all the activities necessary to allow the employee to begin working productively. The IT orientation service includes online forms for the new employee to fill out, network user contracts for the new employee to read and electronically sign, the assignment of user IDs to the new employee, the creation of logs that record the date and time the new employee performed the orientation activities, and so on. A regimented, seamless orientation IT process can reduce confusion, duplication, and delays surrounding the necessary steps to bring a new employee into the organization. The full orientation service would be comprised of several technical and operational processes with management involvement of IT and other business domains. Is the new employee orientation service a Business Service? Yes. The business customers clearly see and use the orientation service, and directly interact with IT components to accomplish a necessary business tasks. Without a properly working IT orientation service, the new employee would not be able to get to work and start providing value to the business. The data backup service is used to automatically make copies of critical business data throughout the enterprise. This service is configured to make these regular backup copies of data based upon the data characteristics. Business customers do not perform any actions to make the backups; this process is completely controlled and managed by the IT area. In fact, most business customers are likely not aware that data backups are even made or how often they are made. Is the data backup system an IT Business Service? No. Business customers do not directly interact with the data backup system; do not perform any actions to support, change, or manage the data backup system; and likely are not even aware that such a system exists. Business customers will experience the business benefits of having the backups in the event backup data must be used to restore business processing, but they do not depend directly upon the data backup service to perform their day-to-day business responsibilities. BSM is an approach that leverages processes and technology to make the goals of IT and the goals of the business generally one and the same. BSM uses a combination of business-driven top-down and technically focused bottom-up perspectives to manage the infrastructure, applications, services, and processes. The Office of Government Commerce defines "Business Service Management" within the ITIL V3 documents as "An approach to the management of IT Services that considers the Business Processes supported and the Business value provided. The term also means the management of Business Services delivered to Business Customers." Think about how your network and computer system applications are engineered; in most organizations, there are several layers of technology. Most IT shops manage their IT components in a bottom-up way, evaluating the performance of services based upon monitoring metrics from these many technology layers. Bottom-up service management focuses on collecting data from these technology layers, then analyzing them, both in real-time and from a historical trending perspective, to determine where changes, corrections, upgrades, and other modifications are necessary. The data is usually captured using a variety of proprietary methods—such as in-house written tools or through purchased vendor packages—as well as non-proprietary methods—such as database queries, log files, SNMP, and so on. It is very important for IT leaders to have this detailed technical performance and monitoring information. Such data provides important details to help the IT areas perform at maximum capacity and with minimum downtime. Additionally, this data can be used to make intelligent SLA decisions and for making reasonable capacity planning decisions. This bottom-up IT services management approach of using operations management tools to consolidate and correlate event and performance management from all the IT sources (systems, servers, networks, storage, applications, …) from throughout the enterprise allows IT leaders to prioritize their efforts and proactively manage the infrastructure to help prevent problems. This information can then be mapped to business services for evaluation. Configuration Items (CIs) can be identified using this type of bottom-up approach to reveal concern before a critical business service is impacted. However, although these bottom-up service-oriented IT management activities are absolutely necessary for a healthy IT organization, these reports and data do not provide clear meaning to business leaders. Of course, all this data impacts the business, but the reports, data, and other communications that make perfect sense to the IT folks will be completely lost on most business leaders. This is where the top-down approach for IT Service Operations management brings meaning to the business leaders using those services. The top-down perspective is basically starting at the highest strategic business level to determine what is important to meet the strategic business goals and revenue targets. This view is new to most IT shops. To have this top-down perspective, IT leaders must know and understand the needs of the business customer for meeting their goals. IT leaders must no longer be content to know technology; they must also truly know and understand the business value of the services they are providing. To do so, IT leaders must work closely with their business unit customers to define the IT services that are necessary for business success and determine whether these services already exist, must be improved upon, or must be built from scratch. The IT leaders will take this top-down business perspective to create a view of the supporting infrastructure needed to deliver the most important business services with the most appropriate SLAs. A top-down perspective brings business insight into the IT services. It raises understanding about the business within the IT areas working on those services. In addition, it allows the IT areas to create reports and dashboards for the business areas using terminology and images the business areas will understand. A top-down perspective allows IT areas to drill-down from the high-level business perspectives of the corresponding IT services deep into the complex IT infrastructure details that IT leaders must have to successfully meet SLAs. Using BSM tools allows IT leaders to communicate real-time data with corresponding SLA values and the corresponding status for each service as well as clearly illustrate how IT supports business. Effective top-down BSM tools demonstrate to business leaders the impact of IT upon the business. The top-down views of Business Services need not be limited to the IT components. In fact, by including all the services involved with a particular business process, you can help build a complete picture of the entire process to more easily identify business priorities, potential problems, improvement areas, and other related issues throughout the enterprise. A goal of the top-down perspective is to start looking at a business process from a high level and drill down, layer by layer through the process, to get the most technical of the issues within the process to reveal and isolate problems and minimize business impact. The difference between the two approaches is simply the starting point. In the bottom-up perspective, you look at what you have to offer and build services that can be supported by that infrastructure; in the top-down perspective, you define the services that are needed by the business and then ensure that adequate technology infrastructure is in place or obtained to meet those needs. Consider medical book anatomy charts where there are multiple clear plastic images that you can turn, one page at a time, to start from an illustration of the human body as it looks to the naked eye (the top-down perspective) and with each page turn you reveal another layer lower into the human anatomy until you get to the muscles, then bones. When you start from this point (the bottom-up perspective) and flip each page back, you then build back up to the original picture. In addition, mapping these relationships is a key enabler for a federated CMDB. And an effective BSM solution will allow for discovery and dependency mapping. BSM helps IT leaders to clearly determine not only the technical performance of each service but also employee productivity and how well the IT area is meeting customer SLAs. Automation can also greatly assist IT leaders in knowing the business impacts of the systems for which they are responsible, which will help them better prioritize and plan for upgrades, repairs, and other changes. Another benefit of a comprehensive BSM approach is that it can help IT leaders to identify potential problems before they impact the business. According to an IDC study, 41% of IT professionals are not aware of network problems until after they have been reported by end users. Many organizations still use Service Desk tools that are completely separate from the rest of the IT tools used within the enterprise, such as call logging and application use questions. IT shops can benefit greatly from integrating service management processes, such as the Service Desk, with the rest of the IT views to best illustrate IT from the perspective of the business. The Service Desk represents a major resource commitment in most organizations. By placing emphasis on risk mitigation within a Service Desk area that uses tools that are integrated with the rest of the enterprise, organizations can improve problem and incident resolution by catching such issues as quickly as possible. ITIL V3 provides guidance about how to manage the Service Desk in a way that minimizes customer disruption and maximizes a quick, efficient resolution to the problem. Highly effective Service Desks will reduce costs and downtime risks as well as lessen, or even eliminate, customer dissatisfaction through a comprehensive set of processes that are designed to track incidents throughout their life cycle, keeping customers informed of the latest remediation efforts and following SLA procedures for monitoring events and escalation, as necessary. A key aspect of linking BSM and system monitoring with problem management is sharing information between the two domains to more effectively perform problem management. Tools can be used to automatically direct problem tasks to the appropriate support people with the information necessary to most efficiently address and resolve problems. Linking in the CMDB improves upon this. Automating problem and incident management triage routines eliminates many of the usual ad hoc phone calls, manual analysis, and data re-entry, especially for common tasks. This is also, perhaps more typically, associated with run book automation (RBA), discussed in the next section. Automating diagnostics routines so that corrective actions and data transfer to Service Desk systems can occur without human intervention; virtually allowing the data center to heal itself for many types of common problems and incidents. This is also, perhaps more typically, associated with RBA, discussed in the next section. According to Gartner, the increasing use of IT process automation, which is frequently referenced to as RBA has also increased the need for IT operations leaders to deliver and provide higher IT operations efficiencies "including reducing mean time to repair (MTTR), increasing mean time between failures (MTBF), and automating IT resources provisioning." According to Webopedia, "Run Book Automation (RBA) refers to technologies used to achieve operational IT efficiency by streamlining run book procedures through automating many of the daily manual tasks. RBA helps organizations by reducing manual tasks which are time consuming and also prone to human-error issues, provides a more efficient workflow through automation, and reduces operational costs while still meeting IT service levels and compliance." RBA can link people, processes, and technologies used within BSM to make IT Service Operations even more valuable to IT leaders specifically and to the business as a whole. RBA helps to extend and enhance BSM by building bridges throughout enterprise technologies to make a more fully integrated system through which both comprehensive automation and the most appropriate management controls can be achieved. RBA moves your organization from fragmented and manual processing and closer to fully synchronized operations automation. Service Operations and BSM approaches can improve business in very specific and measurable ways, as demonstrated throughout this chapter. Using automation will help to reveal these metrics and improve the value IT brings to the business. The next chapter will discuss the entire service life cycle, including service transition. In addition, the chapter will point out specific ways in which business is improved and made more valuable through the implementation of ITIL V3 processes and will explore key benefits of automating the service life cycle.